Last week in one of my blogs I shared one hint about making cutting hexagons simpler. The idea was to use a very small cutting mat, and turn the entire mat with the fabric and template rather than just turning the fabric and template. If you can't find a small cutting mat at the Dollar Store, maybe somebody that you know has an old cutting mat that can be cut up into squares. The mat that I have is 8" x 10". 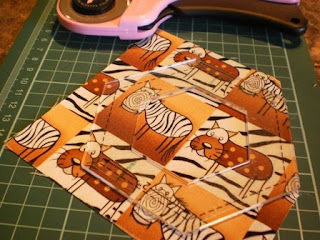 It's perfect for cutting out these I spy blocks. My template/blocks have 2" finished sides. So today I made over a hundred decisions like this. Placing my hexagon template on my 5" patches to see what would be the best way to cut out the hex patch. I've determined that my I Spy Quilt will need 99 hexagons. So I started cutting out from my kit that I got as a result of the swap last week. As I was cutting, I ran into a number of my charms that really didn't suit cutting out into a hexagon, so I set them aside. I soon realized that I might be a little short of charms. So, as I was cutting and thinking of my dilemma, I came up with a way to save some charms. 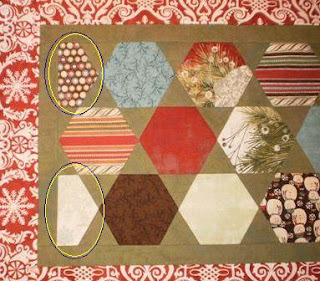 On the side of a hexagon quilt, there will be hexagons that are cut off to square up two sides of the quilt. You can see what I mean here on this table runner I did recently. I've drawn yellow circles to show these side hexagons. So for my I spy, here's what I did to save a few patches. I picked out charms that have a small print, or all over design. I cut out patches that are more than 1/2 the hexagon size but less than 2/3 of the size. I can get two out of a 5" charm square. There, after I decide the color of my background triangles, I'll be ready for my I Spy class/workday that is scheduled for Sept. 13th. Do you like my flock? This flock is quite a bit smaller than the flock we usually see at the cottage. 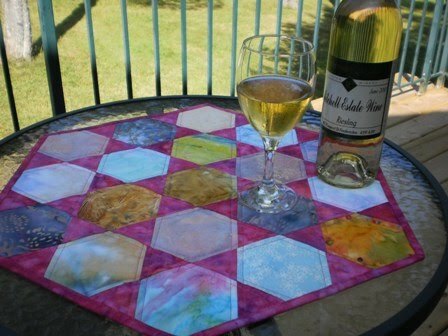 I love the geese formation pattern that the quilt designer - Pam Bono - used in this Flying Home quilt. It' so realistic. At the cottage, we see geese flying in a V formation and it seems that there's always one, that seems to be out of formation. Piecing these 8 blocks took some concentration this weekend, but now that they are done, I can move on to the easy part. The rest of the quilt is done in traditional flying geese blocks. I'm going to use the no waste method for making them. The blocks are bigger than the usual 2.5" x 4.5" blocks that I'm used to. But I have found a formula for sizing the blocks to use the no waste method. I'll test that later this week. If it works good for me, I'll share the method with you. It's taken me a bit of time to pull together fabrics to start my Flying Home quilt. I had a hard to time to find blue for the background of the quilt. After looking in a few stores for the very palest blue fabric and not being able to find it, I decided to dye it myself. It is very pale, just the way I wanted it. 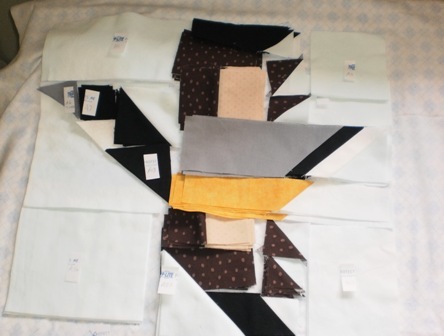 So my strategy is to do all the cutting of the fabrics, (ie: make a kit). 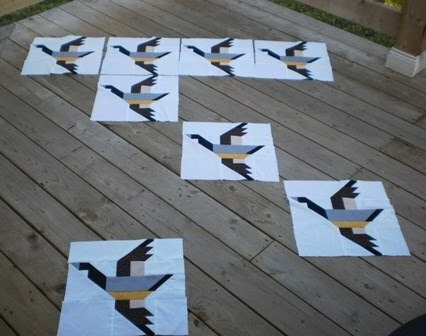 With that done, the next step is to piece the 8 geese blocks. I have the piecing of the sub-blocks (with diagonal seams) done and this is what the components look like before my final piecing of the blocks begin. My plan is to complete the eight goose blocks by the end of the weekend. I was at Baby Aurora's house earlier this week making new curtains for her Mom's kitchen. 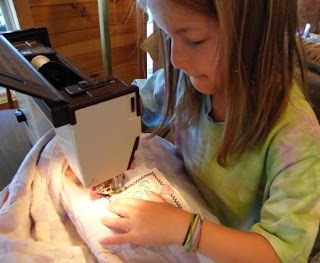 So, we took the opportunity to give Aurora her very first sewing lesson. 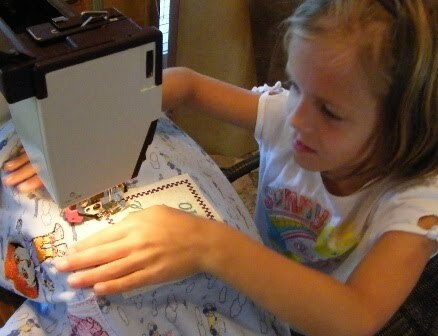 While she sat on my lap, we sewed her "Grammie Camp" patch on a blanket. She's a natural. Late last week, I was lucky enough to get a spot in a beading class that was being held downtown. 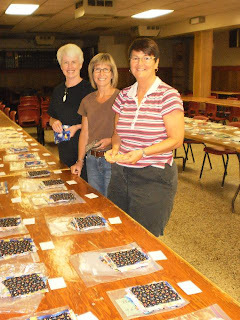 See, for the month of August, the classes were free, and the only fee was the beads and materials used. So I was pleased that I got a spot. The instructions for this bracelet are in a beading magazine, but I'm not sure which one. Picking out the colors takes almost as long as making the bracelet itself. Here's a closeup. 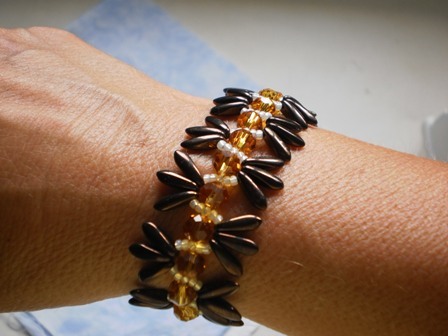 I used brown daggers, amber crystals and cream seed beads. This was the first time I used a magnetic clasp. I was quite impressed at how strong it is. I'll certainly use them again. I'm completely pleased with my project. Isn't it cute! Well, here is my third practice piece doing hexagons. These batiks are mostly from a $5 bag of batik scraps that I bought at our local quilt shop. 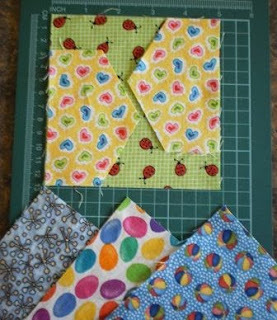 I still have lots of smaller scraps left to do another smaller project that I have in mind. 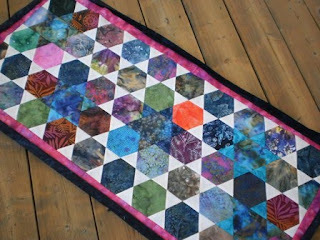 For this runner, I used a slightly different method of cutting the triangles, and it made piecing them a little different. 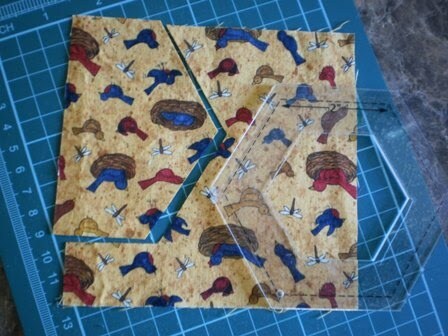 My previous runners, I nubbed off the corners of the triangles, just like Marti Michel suggests with her template set. This topper uses un-nubbed triangles. I used a skinny pink border (left over fabric from last weeks hexagon) and I've just laid out the dark blue binding to see if I like it. And I do like the contrast. Of course, I'll only apply the binding after it's quilted. I tried to get a little creative and used some blue triangles to see if I could make some hidden stars, but they look more like large flowers. Squint your eyes, to see what I mean. Even though it's not the look I was after, I think I'll still enjoy using it. 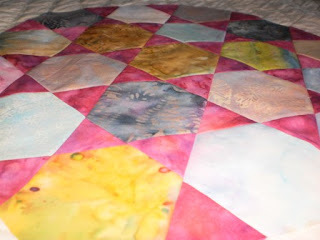 So, I've done all this hexagon prototype work in preparation to make a fun "I spy" quilt for Aurora later in the fall. We had our local "I spy charm swap" earlier this week, I now have my kit of 120 charms. After doing a few things on my to-do list, I'll start fussy cutting each hexagon one by one from the charms. I'll enjoy that. One cutting tip I will share with you is this. I recently bought this mini-cutting mat that is 7" x 10" big. It's so small you wouldn't think it would have any value at all. 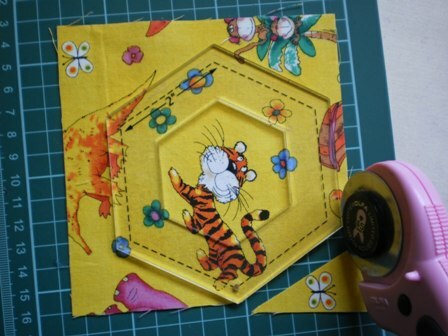 But when I started cutting my hexagons for my practice pieces, I found that this little cutting mat was a great tool. Rather than lift the acrylic template, you just swing the mat around when it's time to make each of your cuts. I'm registered to take a "Hexagon I spy" class locally in the fall, so I won't start sewing until the class. I will enjoy the cutting for now. 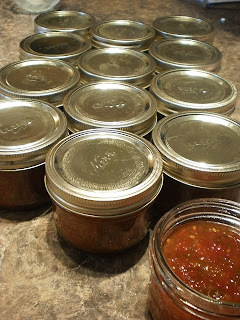 Last year, while snowbirding in the states, I fell in love with the Onion and Pepper relish from Harry and David. My sister discovered a similar one that is just as good at the Gourmet Shoppe. I bought a good supply to bring home with me, but that only lasted a short while. I'm not sure that either of these stores are in Canada, at least they are not in eastern Canada, so buying more is not a good option. So, after a little research on the Internet, I realize that there's dozens of copycat recipes for the Harry and David Onion and Pepper relish. I browsed through many and landed upon this one at "Skip to my Lou" . She has great pictures. I made yesterday and it's a BIG success. 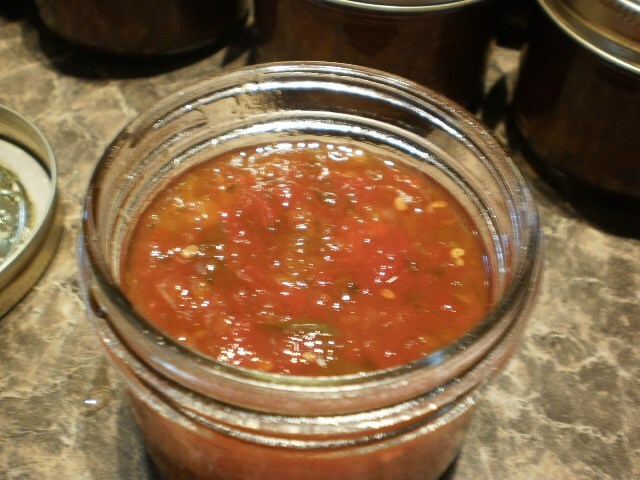 This salsa like relish is sweet, but has a hot kick to it. If you are a red pepper jelly fan, you'll like this. 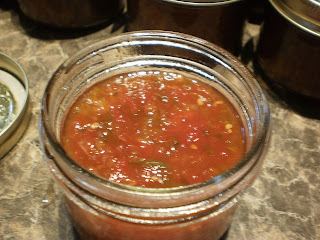 In all my reading about this recipe, a popular appetizer is to mix this relish with softened cream cheese and then to put on a cracker. You can bet that next time I have company for dinner, it's going to be on my menu. Over the past few months, my living room has been the drop off and collection point for "I Spy" kits of fabrics. 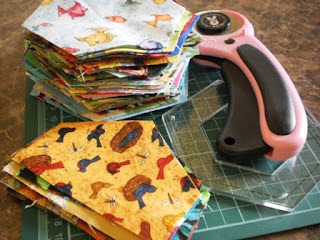 We have 50+ local quilters each turning in 40 charm squares of each of three "I spy" fabrics. So, 120 charm squares in total for each kit to be traded. And today was the day we did the swapping. Here you can see Kathy, Vivian and I swapped charms. This process took longer than any one of us anticipated. We even recruited help from my hubby and the janitor at the church where we used long tables to do the organizing and sorting. In the end, the kits were pretty nice, and now the fun will be to see all the different I spy quilts that are made from these 66 kits. And many thanks to the swappers who left us extra fabrics that will be used for some quilts that will be made for children in the community. I'm pretty sure we can stretch the donated charms into three quilts. Thanks everyone. 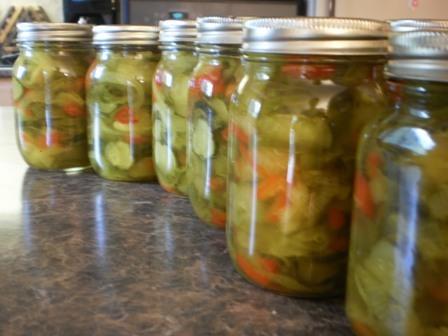 Yesterday was pickle day here in our household. Just like last year, we made mustard pickles and bread and butters. 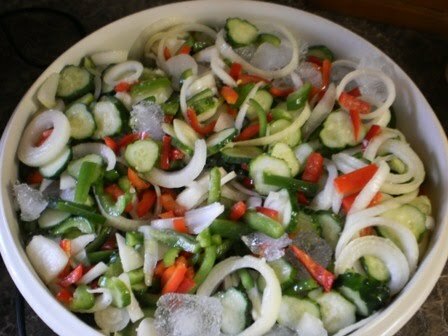 I love the look of the freshly sliced vegetables as they soak in the salty, icy brine. And after soaking a few hours in the brine, they cook up quickly to make a dozen bottles. There's still lots of time to make some. Want my recipe - my sister's recipe actually... I shared it in this link last year. I finished my little Hexagon table topper for my little bistro table at the cottage. It's sweet and I just love it. I used it all weekend. I had originally intended to free motion this little topper, but I forgot my gloves. So, I decided just to machine quilt using my walking foot. I went up and down each seam with pink thread. The simple sewing accentuated the hexagons. A total of an hour to finish. A little project I'm taking to the cottage this weekend, is a very small table runner that I'm quilting. This little runner that I made out of scrappy batiks, will fit a small bistro table that my sister bought hubby and I for our June birthdays. We eat off it all the time but I don't like to set my dishes directly on the glass. 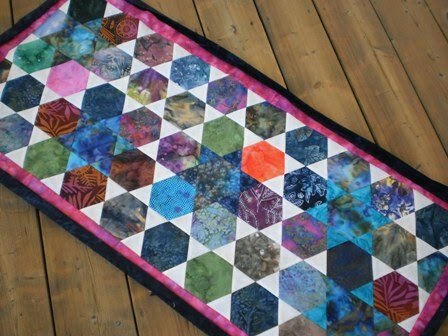 The weather looks fabulous for the weekend, so my goal is to machine quilt this and bind it in pink batik. Let's see how it goes. Sadly, it's the last day of Grammie Camp. Our morning starts out with Yoga as usual. 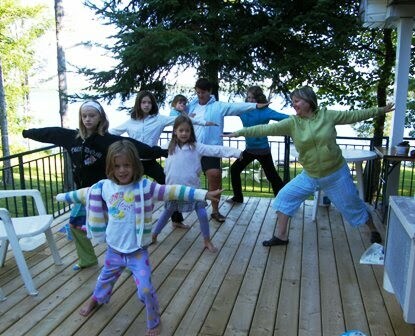 Here Auntie Donna leads us as we perfect our Warrior pose. And after all the different yoga poses, we finish off with a relaxing minute in the child's pose. 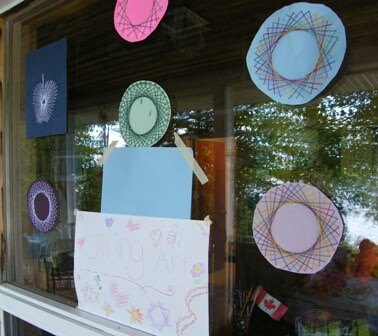 Then after a yummy pancake breakfast that Grampie made, we finished up some of the art that needed to be displayed later in the afternoon when the parents came. Here Caleigh is helping Grace to finish her string art. 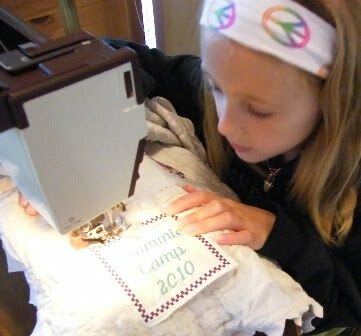 And I gave each of the kids their "Grammie Camp 2010" patch to be sewn on their blankets/quilts. They did the sewing themselves and hopefully when they look at it, they'll remember their very first Grammie Camp for a long time . 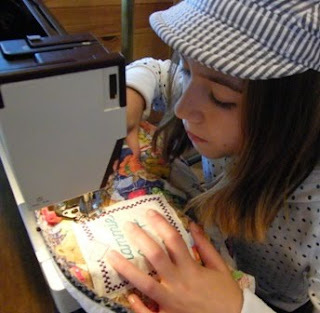 And Grace sews. I'm so proud that all the girls enjoy sewing and are very eager to do the sewing of the patches themselves. 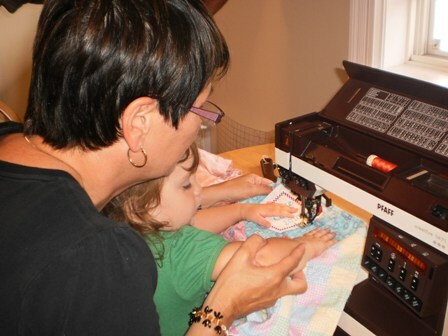 It won't be long and I'll be telling you that Aurora sews, but for now, Grammie will sew her patch on. And so now, here is some of the fabulous art. This is a picture of all the balloon string art. They are in the tree, and it's a breezy day. 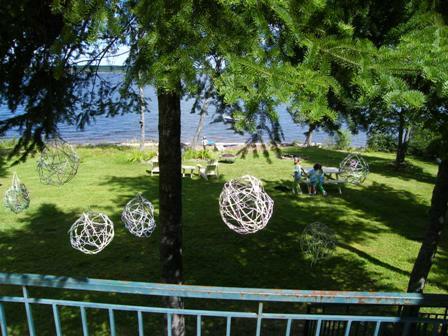 The string balls gently move as the wind blows right through them. You saw the tye-dyed shirts earlier in the week but here they are again, all hanging out to dry. Emily is testing them to see if they can be worn yet. 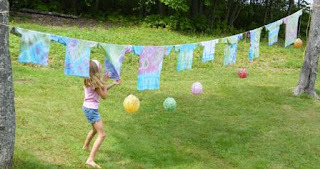 You can also see a few of the Balloon String Art drying under the t-shirts. 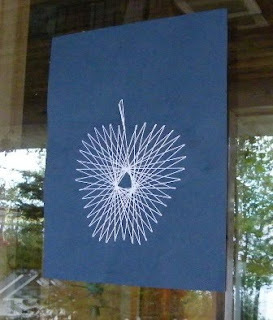 This is string art done with a needle and crochet cotton. 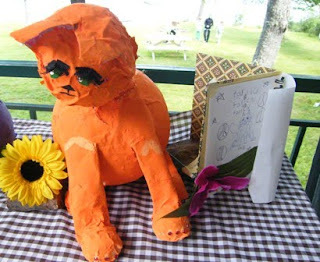 This is a beautiful and quick craft for 8 - 15 year olds. Everyone enjoyed doing it. Actually, I'm going to give it a try now that Grammie camp is over. Jessica had time to do another string art and quickly did this apple. Most fitting because she loves apples. 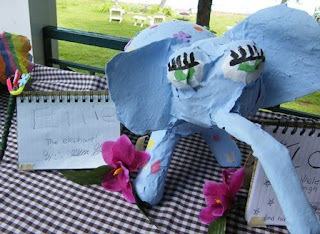 Here is the table where their paper mache animals and the great flower pens are. 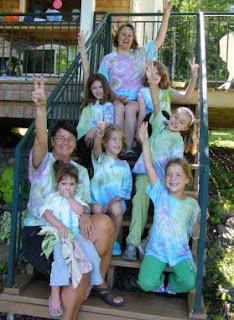 On the table are extra tye dye t-shirts that the kids made for Mitchell. 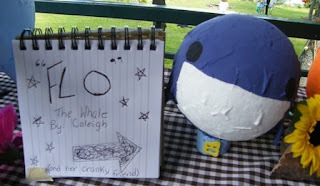 I'll give you a close up of the paper mache because they are so great. First is Graces creation. It's a cat called Tarlick. Because that's what baby Aurora's cat is called and it looks just like her. Next is Susan, the fish. Emily has fish and she did a beautiful job on Susan. Emily even made a yellow stand to put her on because, you know, fish don't have legs. Do you notice the sweet earrings she has on too. 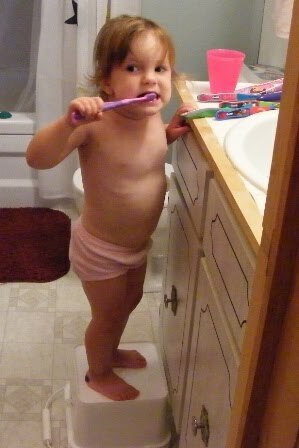 She's a real cutie pie, just like Emily. And here is Flo the whale. She is the cutest little whale with the biggest smile. She's the perfectly purple, my favorite color. 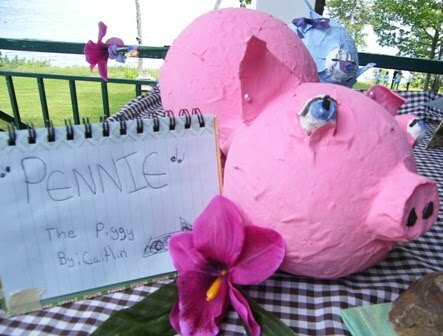 Next is Pennie. She's Caitlin's pig. She has the cutest little tail, and Pennie has earrings too. I love her pink color. Caitlin spells her name with an "ie" on the end instead of a "y" because Grammie has an "ie". I'm so honored to have a namesake - sorta. And last is Ellie the Elephant. She was made by Jessica . It's hard to tell in the picture, but Ellie has polka dots and flowers all over. She has the cutest nose ever, just like Jessica!! So, that's it. Grammie Camp is over. It was a lot of fun for all of us. A big thank you goes out to my sister, Auntie Donna who help me plan this from the beginning... And to Caleigh who came to help out as a camp counsellor. 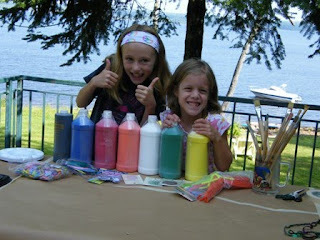 She was great to have to help out with some of the crafts and the spa night for sure. And to my hubby, Grampie for all the trips to the grocery store, the cooking, the dishes, and for being a good sport at the "All Girl "Grammie Camp". 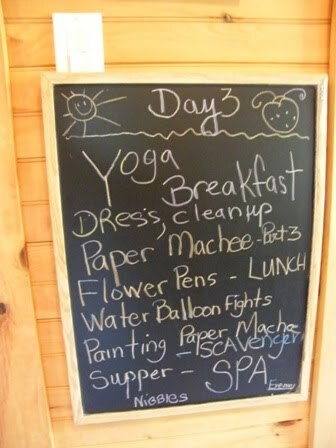 Each day, when the kids got up, they were anxious to see what was on the agenda for the day. You can see from the blackboard, that this Day 3 was to be a busy day. 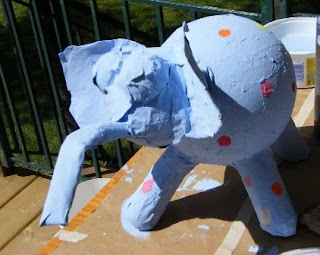 On this day, the paper mache animals were dry and ready to paint. The kids couldn't wait to start painting and give some life to their creations. Here you can see Ellie taking on a fun elephant personality. Jessica seems to have a thing for elephants lately. Isn't she sweet? Just wait until tomorrow when you see her all finished. 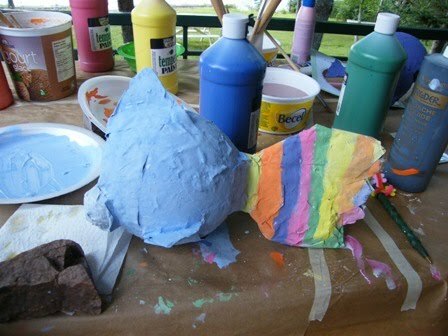 And Susan, the fish ,is sporting a beautiful fan tail. 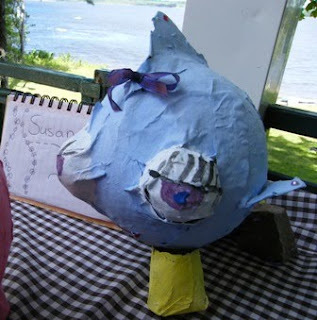 Emily has fish at home, but I guarantee you that not one of them is as pretty as Susan. 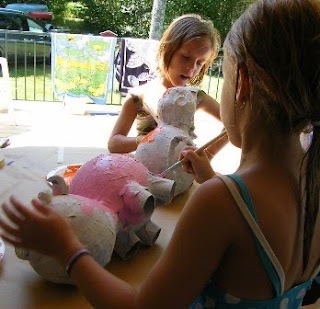 Caitlin and Grace are working on their pig and cat in the shade. It took a couple of coats to get their color just right. You'll get to see all the finished animals in the Art show tomorrow - Day 4. One of the mid morning activities, was decorating pens. This was a fun quickie activity, and we could have decorated many more pens than we actually had. Here shown with our scavenger hunt list is a pretty one with a purple flower which is mine because it has a flag on it with my name on it... "Grammie". After lunch and just before the scavenger hunt, there was some play and swim time. Here are three of the campers just taking a little swim break. I bet they're talking about the scavenger hunt. Speaking of scavenger hunt. 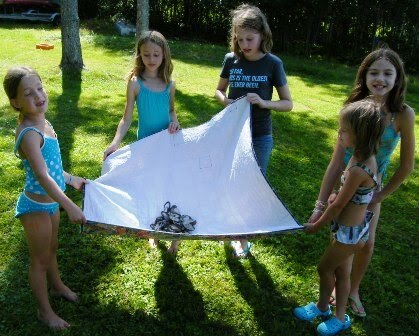 The girls really surprised us at how resourceful they are. 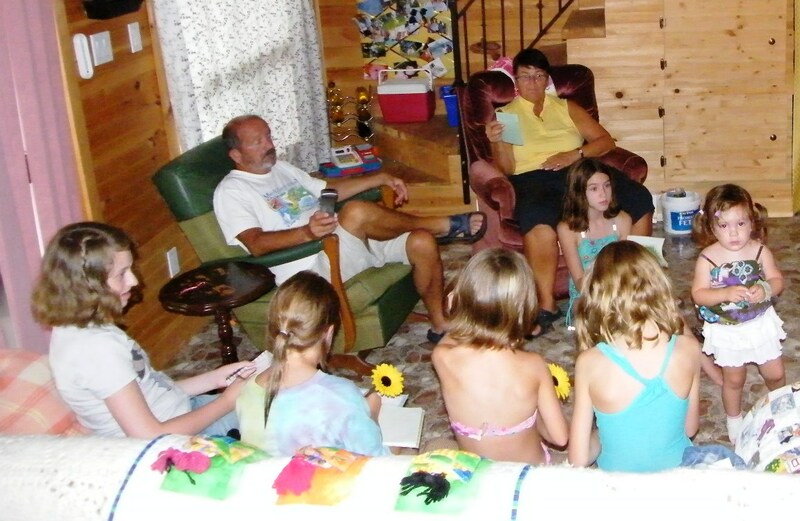 Here you can see me reading the list of items to them as they wrote them into their camp journals. 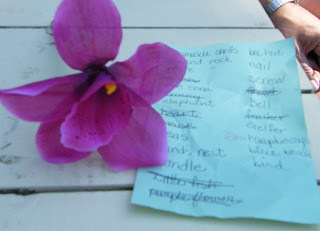 It was a hard scavenger hunt list. 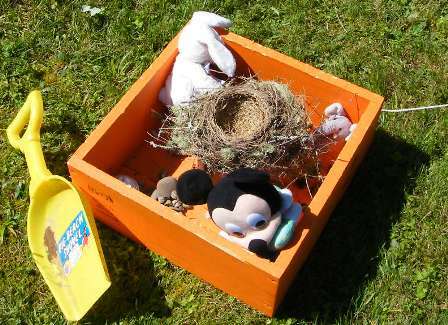 It had things like a beehive, a candle, a birds nest, a bunny, a mouse, an elephant, a nail, a golfer, a screw, 100 mussel shells, a bell and many other things. Since the list was so hard, we opted to give them the list on Day 2, and they would work together to find things on the list. They were not allowed to gather items until they were told, which was after lunch on Day 3. I think that secretly, they had been looking and making strategies together the evening before. Because when we gave them the go-ahead to start the scavenger hunt at 1pm, they all went off in different directions to gather the loot. Within 15 minutes, they were quite proud of themselves and they thought they had everything on the list. Here is the loot that they had gathered. 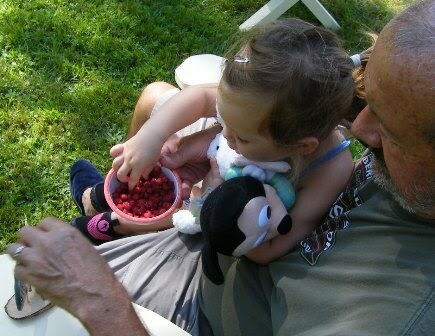 We left the scavenger hunt on until 3pm One item on the list was an Elmo dish full of raspberries. The girls discovered that they interpeted a dish full of berries as a few berries in a dish. My sister and wondered out loud "Would this be the item that takes them down?" The kids discovered that they were short over half a dish of berries. 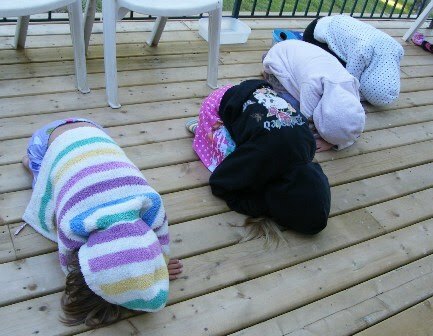 So, just before the scavenger hunt deadline, they all took off in search for more berries. My sister and were sure they would not be able to get at one thing on the list. We were totally surprised that Grace was the brave one who found the old nest in our upside down canoe and dislodged it. Everyone knew it was there and unused by birds for a couple of years, but nobody wanted to touch it. Grace saved the day. 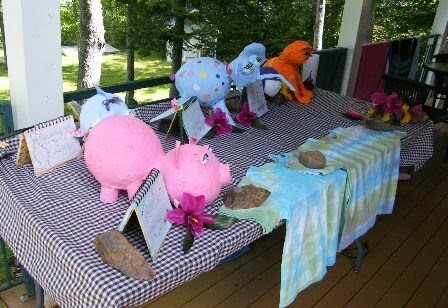 Well, the kids presented their items one by one and Grampie and Aurora were the judges. They squeaked by and had everything on the list. hey were ecstatic. They won the scavenger hunt!! Here are the girls presenting the 100 mussel shells to Grampie. 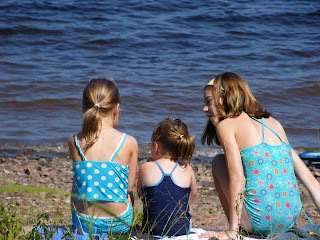 They are holding them in the back of Jessica's I spy quilt... the one with the beehive on it. Thanks to Aurora's mom who brought a nice treat for the girls earlier in the week, we had a well appreciated prize for these scavenger hunters. And can you guess what happened to the raspberries? Yep Aurora ate them all. 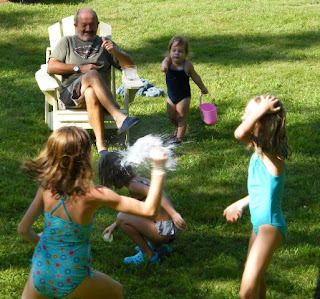 After the scavenger hunt, the kids had a water balloon fight. There was over 100 balloons filled, and here is a great action shot of lots of balloon activity. It was lots of fun. 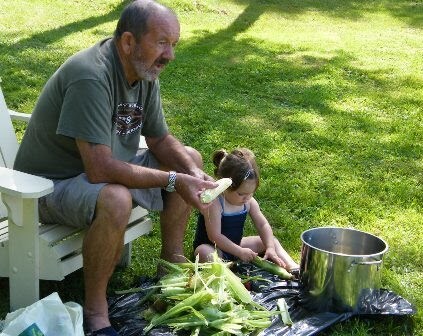 We had a corn boil for supper and here is Grampie and Aurora husking the corn. 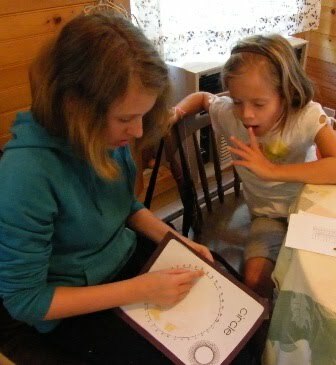 She really liked doing this quiet activity. 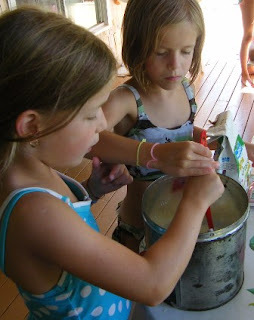 Meanwhile, Caitlin and Grace are preparing strawberry ice cream for dessert! The ice cream maker is on its last legs. The last big thing on the schedule for today was a SPA night for the girls. 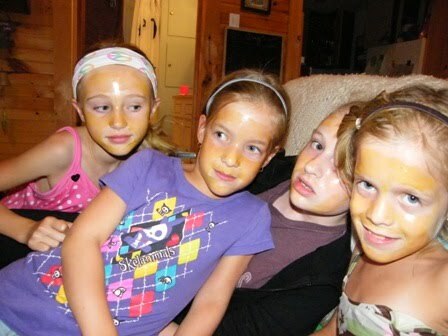 We had peel off mask for tweens (available at Shoppers). We set up stations where Emily did everyone's nails with the buffer, I applied polish to everyone's finger nails. Auntie Donna massaged feet and hands with Oil of Olay beauty cream and Caleigh applied the peel off masks to the girls faces. 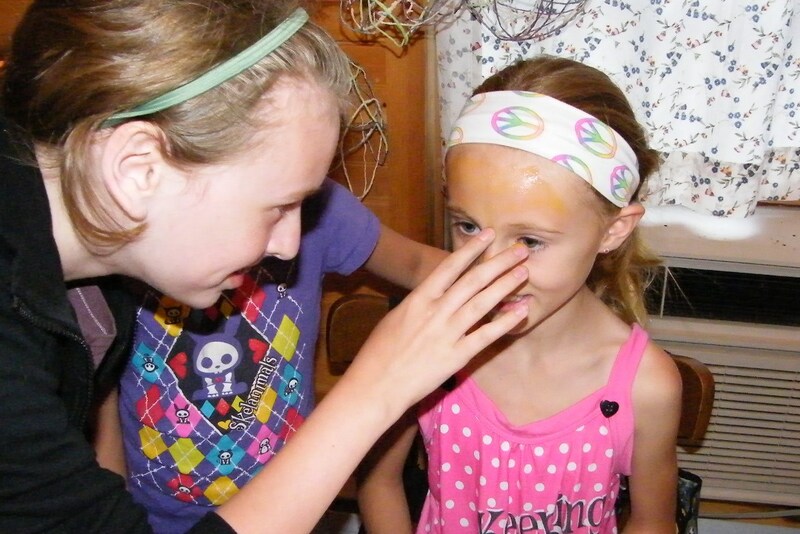 Here you can see Caleigh applying the amber colored mask to Emily's face. Caleigh was a real pro, talking the kids through the whole thing. As the mask dries, the trick was not to laugh because as you probably know, the masks stiffen and make it impossible to move your cheeks. What a strange feeling! Here you can see Caitlin getting the full meal deal. Emily is massaging her hands, and Auntie Donna is working on her feet. Here is a group of the spa girls. Grace couldn't stop smiling while the mask was drying, and her mask dried with her smiling... she's such a cutie, mask and all. Jessica is saying "STOP - Don't make me laugh!" Caleigh took off all the masks after they dried for half an hour. It's amazing how soft and supple the mask made the kids skin feel. What a fun experience. Do you remember your first peel-off mask? And what was Aurora doing through all this. Just like the big girls, she got a foot and hand massage from Auntie Donna and I put polish on her nails. And brushing her teeth with her new Cinderella toothbrush was part of her evening as well. This busy day ended with the campers watching "Finding Nemo" and some popcorn. Whew, what a busy day. Tomorrow - the last day, and the art show!